So what does intrepid top crime reporter of the Clarion and cohort of The Phantom, Steve Hudson, read when he’s not getting knocked around like some second rate Tonto or Robin, the Boy Wonder ? After Steve got knocked around, again, with brass knuckles at the beginning of the story (“I felt like one of Fritzie Zivie’s sparring partners) (Fritzie Zivic (May 8, 1913 – May 16, 1984)), and later kidnapped (sheesh ! ), only to be rescued by The Phantom (racing from a “tattoo of bullets”), “He wondered what to do with the evening. Movies, unless they were full of action and had strong plots, bored him. He never managed to see “Oklahoma !“, but that didn’t bother him. From what he read and heard he could still see that musical in the years to come. I would have said he read “The Candid Camera Kid” but the Kid was out of DETECTIVE NOVELS MAGAZINE by June 1944 after 23 appearances; 2 more would appear in THRILLING DETECTIVE MAGAZINE (Nov. 1944 and March 1945). “The Crimson Mask” was also gone from that same magazine; hey, you know Steve Hudson only reads Thrilling/Better publications, right ? So, he probably read “Dan Fowler: G-Man”, and “The Black Bat” (Black Bat Vol.2; Black Bat Vol. 3; Black Bat Vol. 4). There was also the “Willie Klump” series by Joe Archibald in POPULAR DETECTIVE (near 50 stories (of 65) that can be read for free at PulpGen). …”There was a radio in the power room (rich people, yea know – DLS)… It was playing dance music, a broadcast from Lenny Hildrereth’s ‘Green Pastures.’ Well, right at the middle of one of the best numbers the music stopped and a funny thing happened. A voice came on and said, ‘Calling the Phantom. Calling the Phantom Detective !’ It said it five or six times before if faded out and the music came back.” (I like the stories better where they call him just “The Phantom”, as they should – DLS). A web search for Lenny Hildrereth/Big Band/Swing Band/band leader/conductor brought up nothing. It must be nice to be as rich and powerful as Frank Havens, publisher and owner of the Clarion (a whole string of newspapers), to cut in on FCC radio transmissions just like that. Then again the Federal government wanted him to contact the Phantom for a diplomat’s murder. 1) “After three more rings brought no response , the Phantom took his master key from his utility belt… ‘er, I mean… his pocket and inserted it into the doors lock. That key had been made for him by a Viennese locksmith, before the war, when the phantom was in Austria. There was no other key like it in existence, he was sure. No lock was proof against it, once the key was fitted to wards and tumblers and it’s delicate barrel mechanism adjusted so that its flanges spread”. The use of sophisticated gadgets as needed. 3) “The Phantom, who read and spoke Spanish with the same fluency he did with so many other languages.” A man of many and all talents. Instead of plugging The Phantom when the villain had the perfect opportunity: “Like a fox with a hound pack at his heels the Phantom ran until he reached a forbidding blank brick wall… his feet stopped on what seemed to be a circular metal cover (O.K., you already know what’s going to happen, still… – DLS). Kuren stood a few feet away, his gat trained on the Phantom. …Trapped in a cell-like compartment that offered not the slightest chance of escape ! In all his excitement packed career he couldn’t remember any predicament equally as hopeless” (sure there has been, there’s innumerable instances much more dramatic and threatening than this !!! – DLS). “So I’ve heard,” the Phantom said. …The Phantom shrugged. He had decided on a desperate charge forward – stopping a bullet, and hoping it would not be fatal – when Kuren ended the idea for him. Kuren’s left hand reached out and fastened on one of several levers… and gave it a yank. I told you you knew what was coming ahead of time. So reaching your hand outward from your body is faster than pulling one finger on a Tommy Gun trigger, right. Just shoot ’em and be done with it !!! There is another inconsistence in the story. There is mentioned of “his superb physical condition”, yet earlier in the story, “…A fist smacked into the Phantom’s face… The man flung the waiter out of his path, sprang for the stairs and with lightning speed disappeared down them. The Phantom put his gun away. No use to follow him. The man had been too fast, too agile.” Richard didn’t even attempt to give chase and the assaulter was just a few seconds ahead. In movies and television shows today the cop or detective, in led physical shape, would have sprung up and given chase for the next 5 – 10 minutes, always hoping the culprit would stumble and fall (which they usually did). Not so with The Phantom in this instance for all of his amazing training being the “Nemesis of crime”, and “Scourge of the underworld”. This wasn’t a very good or exciting story. A South American Consul’s is murdered; Washington asked Frank Havens to contact The Phantom; one of the masterminds wants to pay 10 cents on the dollar on shares for a useless gold mind in Honduras (Van Loan and Emily Millard have the rest of the remaining shares); Steve Hudson is beaten or captured twice; The Phantom goes into the villain’s Turkish-Bath hideout 3 times, climbed up or escaped down the stairway the same amount of times; travels up and down the streets and by-ways of New York 3 times or more in his car; using an old, overused Pulp standby, the story ends on a dock, in a (house)boat where the villain, and the part of his henchmen that are left, have a very quick gun battle and wrap-up. I thought the gang wanted to buy the mine to keep people away from it, in order to be used to hide Nazis and their loot (WW2 and all), who would pay good money. I also thought that Emily Millard would have sold her shares to Richard Curtis Van Loan, at his request, for her needed blackmail paying money (another part of the story plot) and then tell the criminal mastermind that Van Loan would never sell (they had asked him much earlier, and he only stated he’d need time to think on it). That would have been at least a slightly better plot. 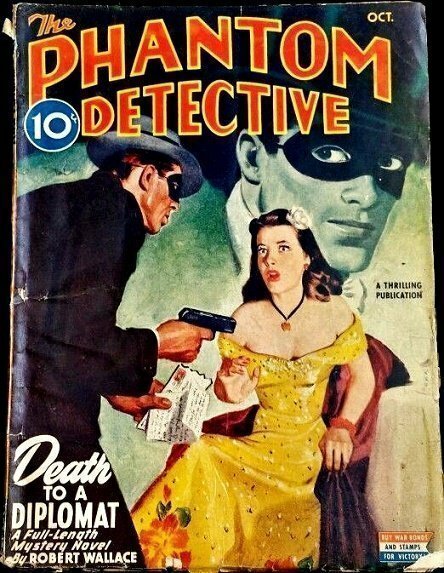 According to Tom Johnson’s “Phantom Detective Companion” this issue was either written by Charles Greenberg or C. S. Montanye (FictionMags says Montanye). The cover is by Sam Cherry, who’s large output was 90% Westerns.